Hmmm the bikesandbuildings jury is still out on this one. Looking at the details individually I think this is a really well thought out bike that's obviously freaking fast, well at least it is with Spartacus at the helm. But somehow it just looks a bit ungainly with that bit sticking out at the front and the dropped seatstay. 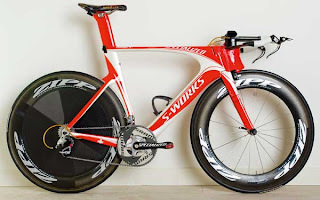 It's a bit hard to argue when this bike just won the world's TT by a country mile but am I the only one out there that feels it looks like Specialized gave the front section to one guy, the middle to another then thought if we chuck the brake under the chainstay we have a rear? Oh well, on speed alone it must classify as bike pron.